Downtown&apos;s famed LaSalle Street canyon and 250 South Side bungalows could take a step closer this week to being listed on the National Register of Historic Places, according to a draft agenda by the Commission on Chicago Landmarks. The proposed West Loop/LaSalle Street Historic District would place 70 historic buildings on the National Register in an area bounded by Wacker Drive, Wells, Van Buren and Clark. 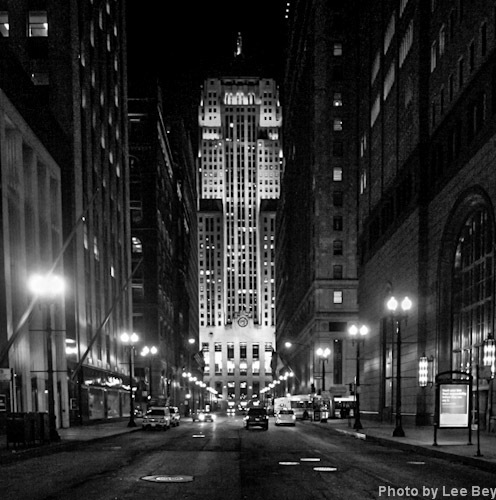 The district would also contain some of the city&apos;s best late 19th and early 20th Century architecture, including the Rookery Building at 209 S. LaSalle; the City Hall/County Building and the Chicago Board of Trade, seen in the above photo, at Jackson and LaSalle. The landmarks commission&apos;s program committee will consider the recommendation at its Thursday meeting. The measure would then go to the state&apos;s Historic Sites Advisory Committee for further approval. The panel is also slated to weigh a National Register district composed of bungalows in the Auburn Gresham neighborhood. The proposed Auburn Gresham Bungalow Historic District would be located in an area roughly bounded by 78th and 75th streets between Paulina and Winchester, featuring 250 intact bungalows built between 1918 and 1932. If approved, the district would be the city&apos;s 11th bungalow district to hit the National Register since Chicago began actively documenting and preserving the venerable one-and-a-half story home – which make up about a third of the city&apos;s housing stock – just over a decade ago. South Shore, Rogers Park, Portage Park and Chatham are among the neighborhoods with a National Register bungalow district. The National Register listings would recognize the importance of the downtown structures and the Auburn Gresham homes, but in both cases would also make possible state and federal historic tax credits to assist their rehab.